Building, leasing, and operating oil rigs has been a rough business as of late, but Helmerich & Payne is a survivor and ready for the next upturn. Helmerich & Payne, Inc. (NYSE:HP) investors have lived through some tough times since oil prices peaked in mid-2014. But this oil and natural gas services company easily stands out from competitors like Nabors Industries (NYSE:NBR) and Patterson-UTI Energy (NASDAQ:PTEN). If you are looking for a way to buy into an energy industry recovery, Helmerich & Payne should be on your watch list. There's no question that Helmerich & Payne investors have suffered mightily since mid-2014. The stock fell by more than 60% between June of that year and the start of 2016. And while it's made up some lost ground, it's still down by around 33%. But the best way to understand that is to look at the company's active rigs. In a nutshell, Helmerich & Payne builds drilling rigs and then leases them out to customers. When times are flush, it can't build rigs fast enough to satisfy demand. But when drilling activity slows, as it has in the past two years, its rigs sit idle. Generally speaking, that means no money is coming in the door for those rigs. Chart one shows just how far the company's active rig count has fallen. HP's active rig count. Image source: Helmerich & Payne. Although Helmerich & Payne has taken its lumps, it remains financially strong. In fact, it has one of the best balance sheets in the industry. That gives it a solid foundation to fall back on during hard times. HP's debt relative to that of its peers. Image source: Helmerich & Payne. And, despite the industry downturn, Helmerich & Payne is generating plenty of cash to support its business and pay its generous 3.5% (or so) yield. The fall in demand for newly built rigs essentially pushed the company's capital spending down, while depreciation remained relatively high from the rigs it had been building in recent years. That means that GAAP earnings can look horrible because of depreciation expenses, but once you add those back into the cash flow number, Helmerich & Payne's business looks much more robust. 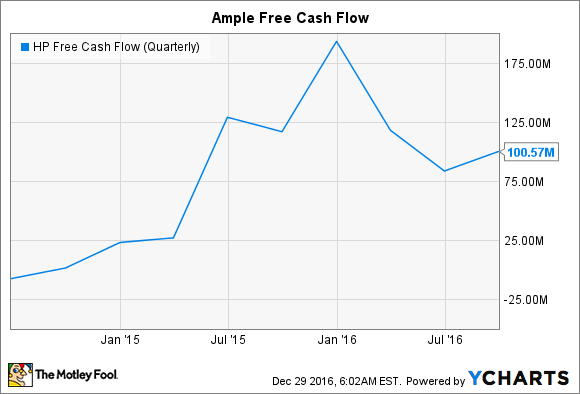 HP Free Cash Flow (Quarterly) data by YCharts. So, all in all, it's fair to say that Helmerich & Payne has handled the downturn in relative stride. But it's also really well-positioned for the next upturn. That's because it has one of the most advanced fleets of drill rigs around. The oil and gas industry has been shifting toward what are known as AC drive rigs, which are fast-moving and efficient, for several years. As the chart below shows, Helmerich & Payne has more of these rigs than any of its peers. And with so many rigs idle, it can quickly put the most modern, and in-demand, rigs to work when drilling demand picks up again. HP's leading position in modern AC rigs. Image source: Helmerich & Payne. Clearly, Helmerich & Payne is ready for the next upturn. But it's also ready for the longer term, too. That's because the industry shift to the type of AC rigs that the company specializes in isn't over yet. As the three pie charts below show, AC rigs have taken significant share of the drilling market, but there still are older machines out there that will eventually be replaced with newer technology. So Helmerich & Payne is in prime position to continue growing its rig fleet with newly built AC rigs once demand has improved enough to bring in new orders. Helmerich & Payne sits at the forefront of a struggling industry. That's bad on the one hand, but it also positions the company for a solid turnaround when industry conditions improve. And the low debt levels and ample free cash flow should protect the dividend, allowing Helmerich & Payne to keep rewarding shareholders while they wait for better days. Helmerich is easily one of the best options in the oil services space today.